Most special needs trusts give the trustee sole discretion to make distributions from the trust funds. There are specific guidelines to be followed in making distributions. A general rule is that distributions should not be made directly to the beneficiary. Instead checks should be made payable directly to the vendors when goods are purchased or to the providers when services are rendered. There are two considerations used in determining a fee; the first is the number of hours worked, the second is the type of service provided. Activities such as paying bills and balancing the checkbook will be charged at one rate. More complicated tasks such as working on legal, investment, and tax matters would probably command a higher figure. 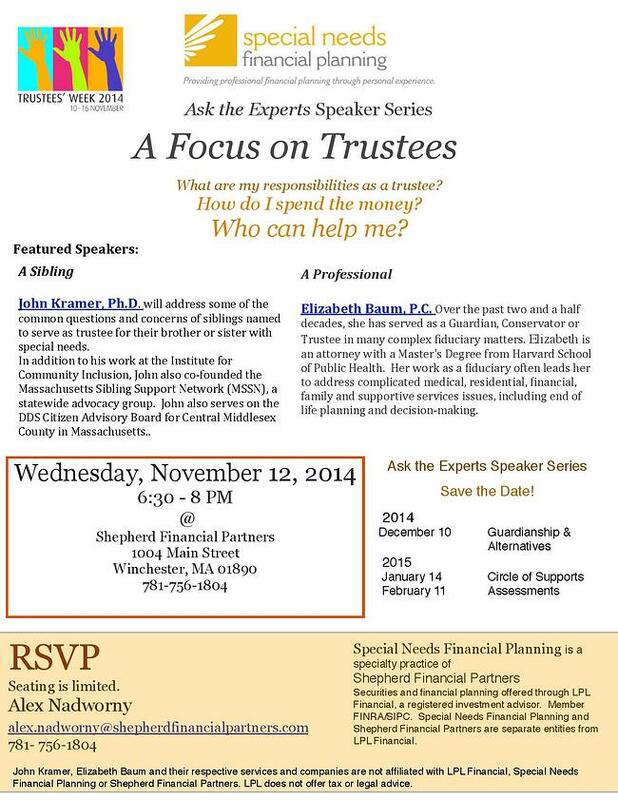 This is especially important if the trustee has a financial or legal background. The trustee should keep a written record of all the time spent on trust activities. Some trustees maintain a log book in which they write down the date, time spent, and nature of each service. If any personal funds are used for the trust, the trustee should keep receipts for reimbursement from the trust assets. Reimbursements should be made promptly. Plan to keep these records at least until the beneficiaries have approved your account. Click below to view an example of a trustee log and to download a blank log. You've Been Appointed Trustee: What Now? 1. Do read the trust document. It sets out the rules under which you will operate. So you need to understand it completely. 2. Do create a checking account for the trust. All income and expenses should go through this account. While you can and should invest the money, a checking account will enable you to make distributions and payments and keep track of them. 3. Do keep the best interests of the beneficiaries in mind at all times. You have what's called a "fiduciary" duty to them, which is an extremely high standard. 4. Don't have any personal financial dealings with the trust. For instance, you cannot borrow money from the trust or lend the trust money to anyone. 5. Do provide the beneficiaries and anyone else indicated in the trust with an annual account of trust activity. This can be a copy of the checking and investment account statements or a more formal trust account prepared by an accountant or attorney. 6. Do invest the trust funds prudently and productively. It is wise to get professional investment advice. 7. Do keep in regular contact with the beneficiaries to understand their needs. 8. Do be aware of any public benefits the beneficiaries may be receiving and make sure you do not jeopardize the beneficiaries' eligibility. 9. Do file annual income tax returns for the trust. 10. Don't fly solo. Get professional advice to make sure you are correctly fulfilling your role. 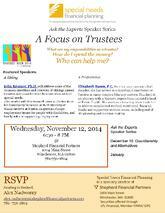 Attend our panel discussion, November 12, A Focus on Trustees. The trustee should keep a written record of all the time spent on trust activities. Some trustees maintain a log book in which they write down the date, time spent, and nature of each service. If any personal funds are used for the trust, the trustee should keep receipts for reimbursement from the trust assets. Reimbursements should be made promptly. Plan to keep these records at least until the beneficiaries have approved your account. the money that funds the trust that will secure the resources for your loved one to be cared for. • Money in the trust can provide some protection from creditors. • assess what steps you can realistically take to provide what is necessary in light of your other financial requirements and goals. Who will pay our child's expenses once he or she becomes an adult? These daunting questions and fears stop many parents in their tracks but creating a plan can ease anxiety. Some of the issues you need to confront are financial: How do you set aside money for your child without affecting his or her government benefits? And some are emotional: Who would understand your child's needs if something were to happen to you right now? Even if you're unable to pay into a trust right now, set one up anyway. This way, you can make the trust the beneficiary of your life insurance policy and your estate, ensuring that those assets don't get passed to your child when you die. Why wouldn't you want your child to be the beneficiary of your estate? Because showing more than $2,000 in assets could make your child ineligible for federal benefits such as SSI.Learn more about special needs trusts by clicking below. A trustee is the person who will be responsible for managing the special needs trust after your death. It can be a family member, a friend, or even a bank or lawyer. The trustee ensures that the money in the trust is spent only on your child with special needs and only on services that you've specified or that are appropriate to your child's needs. The trustee also supervises how the money in the trust is invested. The person who is caring for your son or daughter (the guardian) cannot spend any money in the trust without the trustee's approval. To find an advocate in your area, contact your local school district, organizations focused on your child's disability, or local colleges with special needs programs for a referral. Preparing for your child's financial future is important. But hand-in-hand with that is making sure that your child's everyday needs will be met should anything happen to you. That's where a Letter of Intent comes in. Is your child's daily routine very important? Write it down and be as detailed as possible. The same goes for your child's daily, weekly, and monthly schedules. If all of this is too overwhelming, as certified financial planners and special needs financial planners, we can help. Ask your human resources department if your company offers this service as part of your benefits package.